These are lyrics by John Mellencamp that we think are kind of funny. 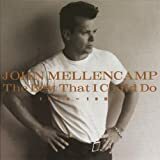 John Mellencamp's, "Jack And Diane"
This lyric makes me crack up every time I hear it. Can't you just picture two young lovers sucking on the same chili dog, Lady-and-the-Tramp style? That being said, it could probably go under "Nonsensical" as well. Well now of course, If you were looking up your nose at someone, then either you have a major injury or the someone is a booger!